Dollar sales in August declined by an expected seasonal 10% to $267,672,127 from July’s $298,747,801, up modestly by 3% from last August’s $259,348,665. The 12 month moving average line for total dollar sales continues to move up indicating continued improving market conditions. This is encouraging as we head into the slower fall sales season. Unit sales were off 2% to 1,429 in August from 1,462 in July, a decrease of 33. This is up 1% from August 2012 at 1,418.This number will increase as late sales are reported. Our ABRE/ACRE Projections for 2013 projected 1,402 sales for August. For August, actual sales for the month were .2% higher than projections and 0.8% higher year to date. Please see here for a summary of the projections http://goo.gl/nytW8 and the spreadsheet with details and month by month projections by area http://goo.gl/GEYWa (see the tabs on the bottom). New sales decreased by 9 units to 138 homes this month from 147 in July and are off by 10 from 148 last year. Used sales declined 2% to 1,291 homes in August from 1,315 last month, a decrease of 96, and up by 21 units from 1,270 last year(Sect E p.3). This month total inventory is 10% lower at 9,583 vs. 10,663 last year and 10,426 last month. The drop in the current month is caused by month-end expirations which should come back on the market shortly. While we are seeing a seasonal uptick in inventory it is still lower than prior years. Although New home inventories are beginning to look a bit high. Active New listings decreased to 824 in August from 1,149 in July, a decline of 325 units (Sect E p.3). 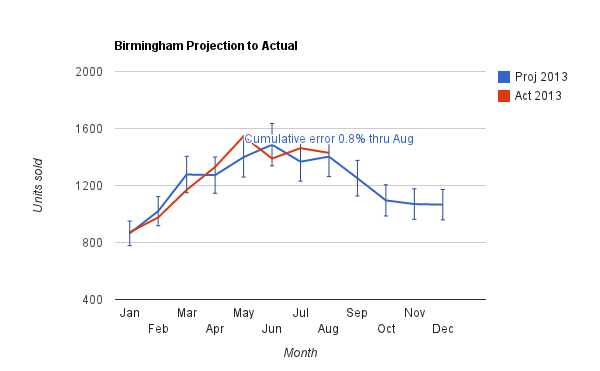 Housing permits went up in Jefferson County to 101 for July from 68 in June. Shelby County permits went down to 32 from 46 (see website for details). Absorption for Used homes in August shows 8 months, two months better than 10 months last year. Used Active listings at 8,759 are lower than the 9,832 last year (Sect E p.3). The number of homes listed in the over $600,000 price range has been climbing somewhat faster than sales, resulting in some upward drift in the months of sales (generally over a year). The market performance is highly area specific, so check the area charts. For instance, Mountain Brook has about four months of inventory except in the over $900,000 category which has 10 months of inventory. Birmingham area Average Days on Market for New houses is 238 compared to last month at 245.This indicates that some of the older stock of new homes are selling. The Used homes DOM was 126 in August, compared with 130 last month (Sect A p.18). NOTE: DOM for Used homes indicates that well priced homes are moving in about 4 months. Average sales price for Sold New homes increased to $290,677 from $280,227 last month (Sect A p2). Average sales price for Sold Used homes decreased to $176,265 from $195,859 last month (Sect A p2). The moving average price for Used Homes has been up steadily for the last year. The 12 month moving average line for New home prices has also been heading up quite nicely since the beginning of the year. Average Home prices, New and Used, are improving (Sect A p2). This entry was posted in Alabama Center for Real Estate, Birmingham, Building Permit, Forecast, Home values, Inventory, Monthly comments, real estate, sales forecast, sales projections and tagged Absorption, August, building permits, Housing Statistics, MLS, real estate on September 18, 2013 by Tom Brander.